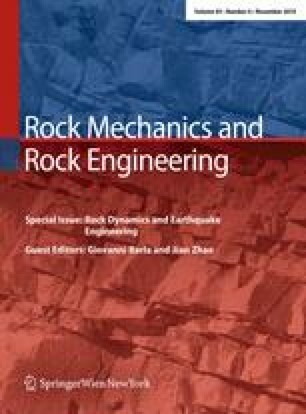 The dynamic characterization of rocks under intermediate and high strain rates is fundamental to understand the material behavior in case of heavy earthquakes and dynamic events. The implementation of material constitutive laws is of capital importance for the numerical simulation of the dynamic processes as those caused by earthquakes. These data are necessary and require experimental techniques able to induce on the rock materials state of loading reproducing the actual dynamic condition. The dynamic characterization has been carried out by means of two special apparatus: the split Hopkinson tension bar and the hydro-pneumatic machine. These equipments are briefly described with a discussion on the results of dynamic tension tests at three different strain rates (0.1, 10, 100 strain/s) on Onsernone Orthogneiss for loading directions 0°, 45° and 90° with respect to the schistosity. Results of the tests show a significant strain rate sensitive behavior, exhibiting dynamic tensile strength increasing with strain rate, up to about two times with respect to the quasi-static conditions in the case of 0° and 45° orientation and more than three times in the case of 90° at high strain rates. Dynamic increase factors versus strain rate curves for tensile strength were also evaluated and discussed. The author would like to express his sincere gratitude to Matteo Dotta, Daniele Forni and Samuel Antonietti of the University of Applied Sciences of Southern Switzerland for their precious help in the analysis of the data and in the execution of the laboratory tests.